On Thursday, September 6, 2012, the President of Colombia, Juan Manuel Santos, rejected a proposed bilateral ceasefire by FARC (Revolutionary Armed Forces of Colombia) rebels aimed at bringing an end to Colombia’s decades of armed conflict. In fact, he declared that he had asked operations to be intensified and stated, “There will be no ceasefire of any kind.”  These comments reflected Colombia’s half-century dirty war, the actors involved, and some of the motives behind U.S. policies that have only served to worsen the conflict. Today, more than 150 days of negotiating have passed since the start of the peace process between the FARC and the Colombian government. Undeniably, President Santos took the risk of agreeing to peace talks that have thus far failed to make significant inroads; an inability to reconcile the main source of friction, agrarian reform, is derailing positive advancement on other critical points in the process (i.e. political inclusion). Delegations from the two sides were scheduled to reconvene on April 2; however, both have agreed to work on issues separately for the first two weeks and meet at the end of the month. The slow process of addressing comprehensive agrarian reform, a sensitive and critical part of the negotiations, is not paying off for the somewhat embattled Colombian president and is decreasing the possibility of reelection in 2014. Neither delegation made reference to a planned nationwide demonstration in support of the peace process that is set to begin on April 9. Back in late October 2012, a poll carried out in Colombia showed that as many as 72 percent of Colombians supported the peace talks. Meanwhile, a poll in late February showed that only 3 percent of Colombians have a favorable view of the FARC, while a whopping 94 percent are against them. It seems clear that most Colombians approve of the peace talks, even though this does not necessarily mean that they see any legitimacy in the guerrilla movement’s objectives and declared goals. The population’s support for the peace talks is an important tool that Santos has at his disposal to continue pushing for them to succeed. Unfortunately, there have been some troubling and tragic developments, such as the recent murders of peasant organizers, which follow on the heels of multiple reports of “police harassment.” The Colombia office of the U.N. High Commissioner for Human Rights, Todd Howland, expressed serious “concern” over the ongoing murders and called for investigations. However, the echoes of unrecognized calls to address human rights abuses are plentiful in the lawless rural areas of Colombia, where the police are not often the harbingers of law and order. This does not mean that Bogota should give up on the peace talks, especially since they proved to be successful in the late 1980s with the demobilization of the guerrilla movement, M19, and later with the demobilization of the paramilitary groups known as the, AUC. Unfortunately, the longer the talks with the FARC drag on without any progress to show for it, there will be more pressure placed on Santos to make some kind of drastic decision (i.e. continue with them or return to a “military solution). Today, Colombia is one of the largest recipients of U.S. military training and aid in the world, ranking it eighth in the world, at $185 million USD, in 2010. 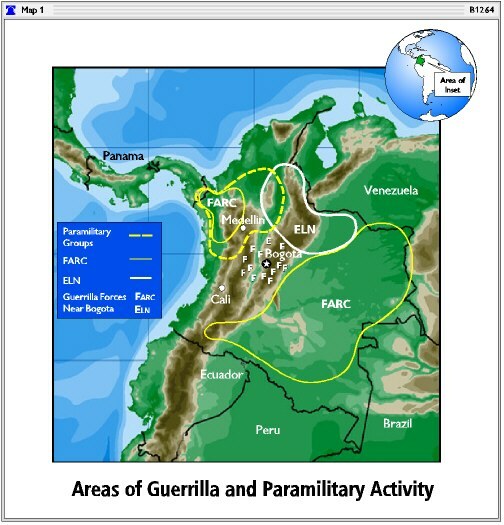 During the Cold War, the United States was involved in counterinsurgency operations in Colombia and provided to the Colombian state millions of dollars for the purpose of combating drug trafficking with the continued flow of military funding and training being sent as a result of President Bill Clinton’s “Plan Colombia” (2000 – 2006) and George W. Bush’s “Andean Regional Initiative” (2008 – 2010). The programs were successfully aimed at the forced eradication of coca shipments as well as the fighting of Colombia’s left-wing guerrillas. Through continued initiatives, billions of dollars have been spent fighting Washington’s war on drugs and its subsequent war on terror. Colombia, however, remains one of the top three cocaine exporting countries in the world. Its internal armed conflict between state forces and right and left-wing armed groups continues to rage. Despite numerous studies that have concluded that the cheapest and most effective way to deal with the drug situation is to redirect funds from law enforcement and forced eradication into treatment and prevention,  over the years the U.S. government has maintained its multilateral approach to the “war on drugs” both at home and abroad. Given the resounding failure to achieve such initiatives, one must ask: is there an alternative objective that the current strategy could be used to achieve comparable goals by other means? U.S. anti-drug policy disproportionally targets the cultivation of coca leaves, thus blurring the line between coca (the natural raw crop) and cocaine (the processed illegal drug). Growing coca has been a tradition of the indigenous people of the Andean region for centuries for multiple uses. People chew on the leaves of the plant or drink them brewed in tea, providing a mild stimulant similar to caffeine. The plant can also be used for the treatment of medicinal conditions such as soroche (altitude sickness). Coca was sacred to the Incas and continues to be an important part of the indigenous cultures of the region. However, Colombian authorities currently do not distinguish between large-scale industrial coca farms and peasants growing the crop in order to survive. 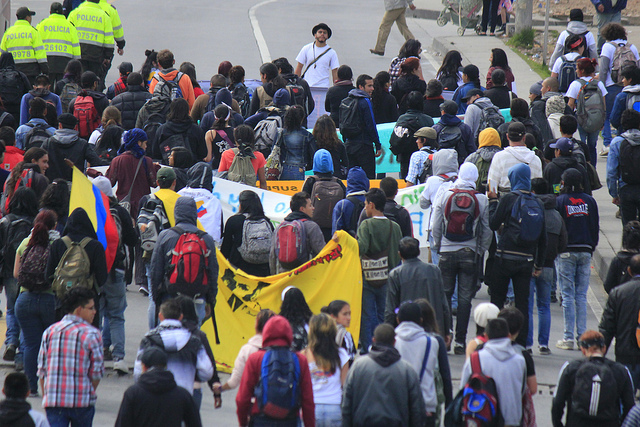 The U.S. has long held a policy of pushing neoliberal economic polices in Latin America. This has been achieved as a result of NGO activity, strategically allocated aid, coercive interventions, qualified conditions attached to International Monetary Fund (IMF) and World Bank loans, and bilateral and multilateral free trade agreements attached to partnership agrements. There is substantial literature exposing the resultant social stratification these policies have brought about in Latin America  but one particular effect of neoliberalism is that it has directly resulted in increased cultivation of coca for export. The neoliberal model aims to re-orientate agricultural production to the export market. While neoliberal policies want to remove protective tariff barriers on agricultural goods, subsidized U.S. agricultural imports make such a reproach difficult for domestically produced crops. Larger farms and ranches with sufficient resources can move into growing large scale export crops, such as coffee, but these crops are soon found to be more labor intensive, require more land, and cost more when it comes to transportation. Many small farmers and peasants, therefore, find that the only economic area in which they can maintain a competitive advantage is in the cultivation of coca. This was also evident in Mexico after President Carlos Salinas de Gotari signed the North American Free Trade Agreement (NAFTA). U.S. subsidized corn imports undermined Mexico’s domestic agriculturalists could not afford to invest in the production of other export crops began growing illicit drugs or left their rural plots for the city. Therefore, a lack of employment opportunities pushed many rural immigrants into the hands of the drug traffickers. In terms of preventing the flow of drugs into the U.S. the militarized approach has one simple economic paradox at its core. By disproportionally tackling production and distribution (the supply side of the equation) without equally tackling consumption (the demand side of the equation), the price of the product is increased. This approach thus provides a greater profit incentive for people to take the risks involved in trafficking and producing illicit drugs. Fumigation also has been widely concentrated in left-wing guerrilla strongholds in the south east, despite the fact that right-wing paramilitaries are known to be involved in cocaine production and trafficking in the north of the country. Suspicions have thus emerged on the basis that the real aim of the fumigation campaign is to remove one of the guerrilla’s key revenue streams (the taxation of coca cultivation in areas they control) rather than coca cultivation in general. U.S. and Colombian anti-terror and anti-drug policies have failed. Peasant farmers, who depend on coca for their livelihoods have been forced to rely on the armed guerrillas to protect their coca crop from planes spraying chemicals. The displacement and terrorization of people and the destruction of subsistence crops in rural areas due to fumigation and military and paramilitary activity have created a large amount of unemployed, disenfranchised, and angry young people, who gravitate towards the guerrilla movement due to the impunity of the armed forces and the perceived inability of the Colombian justice and democratic political systems to hear their grievances or reflect their interests. The Colombian army and paramilitary groups continue to see coca-growing peasants as guerrilla collaborators and therefore legitimate military targets (due to the taxes they are forced to pay on their coca crops). Activities such as Naomi Klein,  have argued that the real aim in Colombia is in fact to maintain a state of constant conflict, This state should have not only sufficient order to protect investments and transport links, but also, sufficient disorder and terror, so as to maintain a subservient and flexible workforce as well as an economic system which allows only a small local elite and foreign multinationals to benefit from the country’s resources. Colombia’s official military protects investments and transport links important to the extractive industries, while paramilitaries closely linked to the official army are revealed as a connected to the U.S. government, sufficiently intimidating any move toward reform of the system. This is achieved through a policy of assassination, suppression, and terrorization of the political left, human rights activists, trade unionists, and peasant and indigenous movements. In 1996, four years before Plan Colombia was passed by the U.S. Congress, the U.S.-Colombia Business Partnership, representing U.S. companies with interests in Colombia, was founded. This organization launched a well-financed lobbying effort for U.S. intervention in the resource rich Andean state. Among the companies represented in this Business Partnership were Occidental Petroleum, Enron, Texaco, and BP. A survey released a few months prior to the passage of Plan Colombia in the U.S. Congress indicated that there were a large number of commercially viable and unexploited oil fields in the Putumayo region of Colombia,  incidentally, the same area that experiences the highest intensity of paramilitary activity and aerial fumigation. It is evident that in the stated objective of eradicating coca cultivation and narcotrafficking in Colombia, the United States’s anti-drug strategy continues to be a resounding failure. From the perspective of the U.S. State Department, however, Plan Colombia was not a failure at all but instead, “allowed for the creation of an effective new model for U.S. intervention.”  As the U.S. Government Accountability Office’s director of international affairs and trade put it, “international programs face significant challenges reducing the supply of illegal drugs but support broad U.S. foreign policy objectives.”  These objectives, throughout the period of U.S. hegemony, have remained the same. U.S. imperialism is not based on territorial control but on economic control. The adoption of the neoliberal capitalist model across Latin America greatly benefited U.S. companies by making resource extraction less expensive (due to reduced corporate tax), labor cheaper (due to labor flexiblization practices), and domestic markets easier to dominate (due to the removal of all state subsidies and the breakup of state-owned companies). The last point holds a particular level of hypocrisy, because, while other countries face the prospect of abandoning all state subsidies, the United States maintains high levels of protectionism in the one area that developing countries would hold a competitive advantage in a free market system-agriculture. The difficulty lies in maintaining a system in which the main beneficiaries of economic production in a country are a tiny, local, elite, and foreign multinationals. This, historically, has been achieved through substantial repression. Throughout the Cold War such repression was justified by labelling as communist any movement or political party whose views fell outside of radical right-wing capitalism. One crucial method of ensuring the maintenance of this economic model in Latin America has been the cultivation of allied militaries, whose ideological beliefs fall exactly in line with those of Washington. The end of the Cold war necessitated a new justification for the continuation of this practice and thus, the war on drugs was born. After the 9/11 attacks, the initiative evolved into a war on terrorism. It is established that U.S. “war on terrorism” policies in Colombia and beyond further alienate the populations of countries, where they are implemented and swell the ranks of the militarized “terrorist” forces the United States claims to be fighting. Nevertheless, the purpose of this war, like the war on drugs and the war on communism before it, is the creation of a façade that justifies U.S. economic imperialism. The ‘terrorists,’ therefore, like the ‘narcoguerrillas’, play a crucial role in maintaining this façade. The United States’s Colombia policy is certainly aimed at making sure left-wing insurgent groups never gain sufficient strength or political unity necessary to overthrow the state. These groups are also a necessary to have as an enemy, just as the continuation of the internal conflict is necessary, to justify continued U.S. military training, aid and intrusion in the affairs of the strategically located, oil and resources of this rich Andean state. “Colombia’s Santos Rejects FARC call for Ceasefire,” Reuters, September 7, 2012, http://www.euronews.com/newswires/1649190-colombias-farc-rebels-to-ask-government-for-ceasefire/. See for example, C. Peter Rydell (1994), Controlling Cocaine: Supply Versus Demand Programs, Rand Drug Policy Research Center. Frye, Alexander, “Spotlight on Bolivia: The “Coca Diplomacy” of Evo Morales, Council on Hemispheric Affairs,” April 25, 2012, http://www.coha.org/spotlight-on-bolivia-the-coca-diplomacy-of-evo-morales/. See for example: Stokes, Susan C. (2001), “Mandates and Democracy: Neoliberalism by Surprise in Latin America,” Cambridge University Press; Weyland, Kurt (2004), “Neoliberalism and Democracy in Latin America: A Mixed Record,” Latin America politics and Society. 46 (1): p135 – 157; Gwynne, Robert N. and Cristóbal Kay (2000), “Views from the Periphery: Futures of Neoliberalism in Latin America,” Third World Quarterly. 21 (1): p141-156. Robin, Marie-Monique (2010), The World According to Monsanto: Pollution, Coruption and the Control of our Food Supply, pg 138. *This nickname no doubt originates from the fact that Monsanto produced the chemical Agent Orange which was used for aerial fumigation during the Vietnam War resulting in birth defects, poisoning of land and outbreaks of cancer. After the war it emerged that Monsanto had known of Agent Orange’s toxicity years before but had tried to cover it up. Due to the side affects seen in Colombians living in areas that have been sprayed with Roundup Ultra, and Monstanto’s less than savoury record, many fear that, like Agent Orange, Roundup Ultra will hold future health implications yet unknown. See for example: RAND Corporation, Sealing the Borders; The Effects of Increased Military Participation in Drug Interdiction, http://www.rand.org/pubs/reports/R3594.html. The study also noted that seven prior studies on the same topic over the preceding nine years had resulted in similar conclusions, including one done by the Center for Naval Research and the Office of Technology Assessment. Villar, Olivar (2011), Cocaine, Death Squads and the War on Terror: U.S. Imperialism and Class Struggle in Colombia, pg. 79. Stokes, Doug (2005), America’s Other War: Terrorising Colombia, Canadian Dimension Vol. 39, No. 4; Pg. 26. Gill, Lesley (2004), The School of the Americas: Military Training and Political Violence in the Americas. Pg 10. Human Rights Watch, (2011), World Report 2012. See for example the website of SOA Watch, an organisation that documents Latin American military officers that have attended SOA/WHINSEC and have allegedly committed human rights abuses: www.soaw.org. Karl, Terry L. (1987), Petroleum and Political Pacts: The Transition to Democracy in Venezuela, Latin American Research Review. pg82. Likewise, electoral law results in overrepresentation of rightwing parties, giving nonelected senators and institutions veto power over the legislator. Olavarría, Margot (2003). “Protected Neoliberalism: Perverse Institutionalization and the Crisis of Representation in Postdictatorship Chile”. Chile since 1990: The Contradictions of Neoliberal Democratization, Part 2. Latin American Perspectives. 30 (6): p10-38. European Commission, Colombia Country Strategy Paper 2007 – 2013. Feinberg, Leslie (2003), War in Colombia: Made in the U.S.A, International Action Center p. 81. Klein, Naomi (2007), The Shock Doctrine: The Rise of Disaster Capitalism. Gorman, Peter (2003), PLAN COLOMBIA: THE PENTAGON’S SHELL GAME, From the Wilderness. Paley, Dawn (2012), Guatemala: The Spoils of Undeclared War. Upside Down World. Cuffe, Sandra and Spring, Karen (2012) Botched DEA Raid in Honduras Exposes How Militarization Terrorizes Communities Around the World, AlterNet. Paley, Dawn (2012), Colombia and Mexico: Drug War Capitalism, Against the Current. Ford, Jess T. (2012), DRUG CONTROL: International programs face significant challenges reducing the supply of illegal drugs but support broad US foreign policy objectives, Testimony Before the Subcommittee on Domestic Policy, Committee on Oversight and Government Reform.